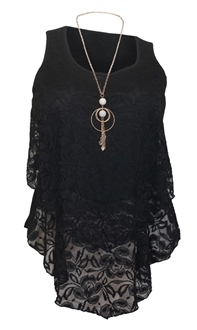 Plus size top features round neckline with sleeveless design. Tiered styling with lined top tier and unlined sheer bottom tier. Gorgeous Floral lace fabric. Comes with beautiful detachable chain necklace. Available in junior plus size 1XL, 2XL, 3XL.